We're sensing a theme here, how about you? Twitch.tv is a site dedicated to hosting livestreams of all sorts of games. Users set up an account, figure out their streaming method and they're off to the races, broadcasting their own gaming content. TwitchPlaysPokemon was likely one of the first of its kind. One channel is hosting a livestreamed game from its start. That game is Pokémon Red and Blue, and there is a catch. Our hero is being controlled by Twitch users in that channel's chat room. They entire a command, and Red responds. It's chaos, it's insanity, it's amazing. Now, a new channel called TwitchPlaysWhatev has started a campaign in the original The Legend of Zelda. Same deal as Pokémon, of course. 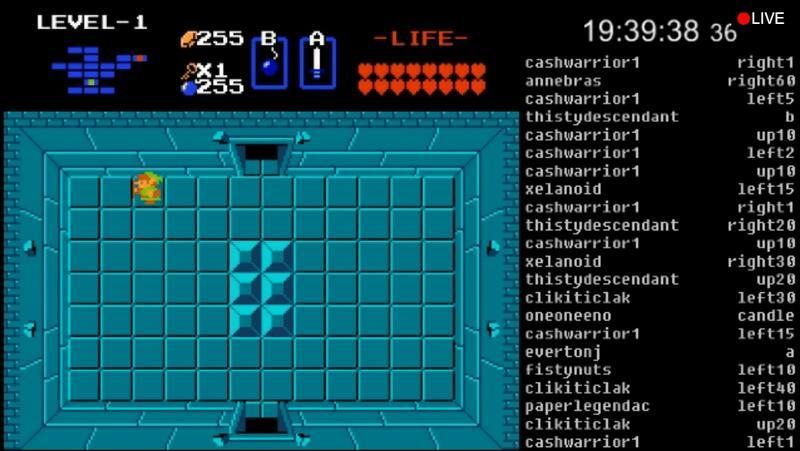 Link is controlled by the players sitting in chat. There are a few tweaks here, though. Link has infinite health, arrows and bombs, something the channel creator said had to be added in order to make the game possible. The creator has also disabled the start button. That was done because the animation for the menu is so long and the only way to exit is by hitting start again. The game would have been unplayable. What do you think of this new trend of crowd-playing classic games? It's maddening, but we kind of love it.